Photo credit: Creative Commons, Wikimedia. Umm al Fahm, one of the largest Palestinian cities in Israel’s 1948 borders, continues to lack street names and house numbers. Of the 301 street names selected by the Umm al-Fahm municipality, the Israeli Interior Ministry has stalled the approval of 60. All of the street names that have not been approved, Adalah: the Legal Center for Arab Minority Rights in Israel reports, bear the names of Palestinian leaders, such as Mahmoud Darwish, Yasser Arafat, and Umm al-Fahm’s former mayors. Attorney for Adalah Sawsan Zaher emphasizes that under Israeli law, the Interior Minister has no authority to prevent a municipality from naming streets as it wishes. Israeli municipalities are required by law only to notify the Ministry of new street names. The right to a residential address is a citizen’s basic right and it is inconceivable that in the 21st century in a city of 60,000 residents such as Umm al-Fahm, there are no street names or house numbers. The naming of streets is not strictly a technical matter, but rather allows the commemoration of cultural identity and national narrative. The Interior Ministry’s red tape is part of the ongoing denial of our unique identity as a national homeland minority. Adalah and Jabareen sent a letter to Israeli Interior Minister Aryeh Deri and Attorney General Avichai Mandelblit demanding the approval of the list of street names submitted by Umm al-Fahm. 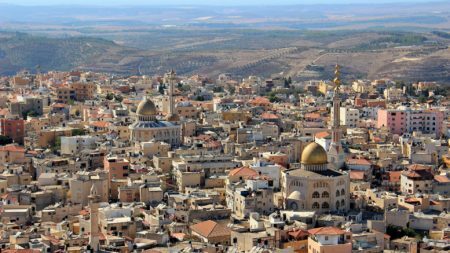 Umm al-Fahem, with a population of 60,0000, is one of the largest Palestinian cities within Israel’s 1948 borders.